The theme of the design is ” Light of the World” and it offers the viewer a celebration of the Gospel of Christ through a combination of classical and contemporary ideas. 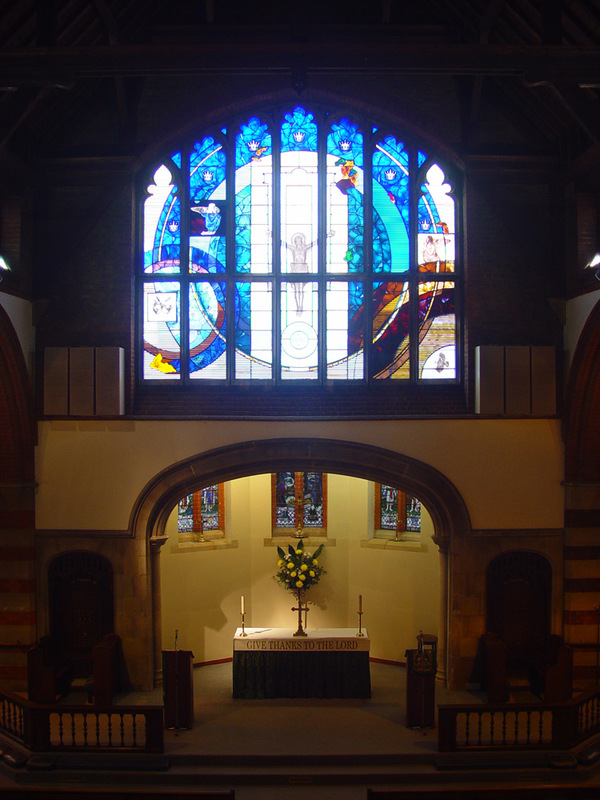 The design brings together references from St. John’s Gospel and combines them with specific elements that are particular to St. John’s Church, Seven Kings. It may help if I take a moment to explain the background to this design, and put it in some sort of context for you. I am very fond of a style of painting developed in America called Abstract Expressionism. I have been greatly influenced by artists such as Robert Rauschenberg, Julian Schnabel, Jean-Michel Basquiat, Andy Warhol, and the British artist Patrick Heron. These artists, and others like them helped to pioneer a way of thinking about art, and indeed a way of looking at the world that had previously not been considered. They began to combine elements together that had previously been held apart. This freedom of thinking would manifest itself in paintings which combined high art with popular culture, the classical with the contemporary, the old with the new, and it helped to shape many aspects of modern culture, (film, theatre, literature) which we all enjoy today. The influence of modern art on contemporary thinking and contemporary culture has been considerable. Alas, there is little indication that this influence is being reflected in contemporary ecclesiastical stained glass. I hope this design will be seen as a way of bringing the message of St. John’s Gospel to a modern world, using modern language. The main thrust of the design is abstract in nature, with the predominant use of rich blues, reds, green and amber, combined with horizontal clear glass prisms that run down the centre of the design. The focal point of the central section contains an image of the Crucified Christ with a folio of the Codex Sinaiticus, showing the last page of the Gospel of John, written in Greek. This central section, together with the background white glass around the outer edge of the design will ensure the window is a continued source of light into the interior. The circular element plays a very important part in this design, helping to re-affirm the church in the 21st century is reaching out to all nations and all people. 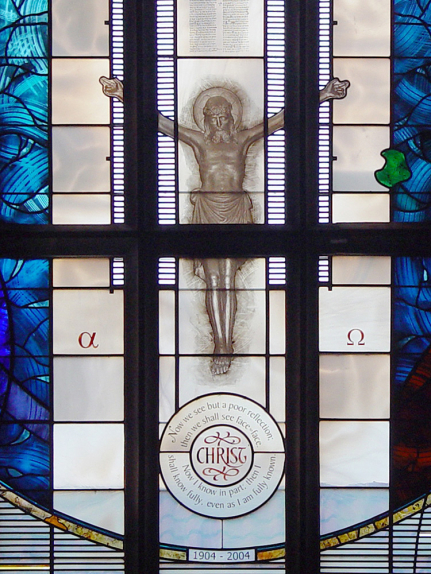 The focal point of the design is the central lancet containing an image of the Crucified Christ with the Codex Sinaiticus above. 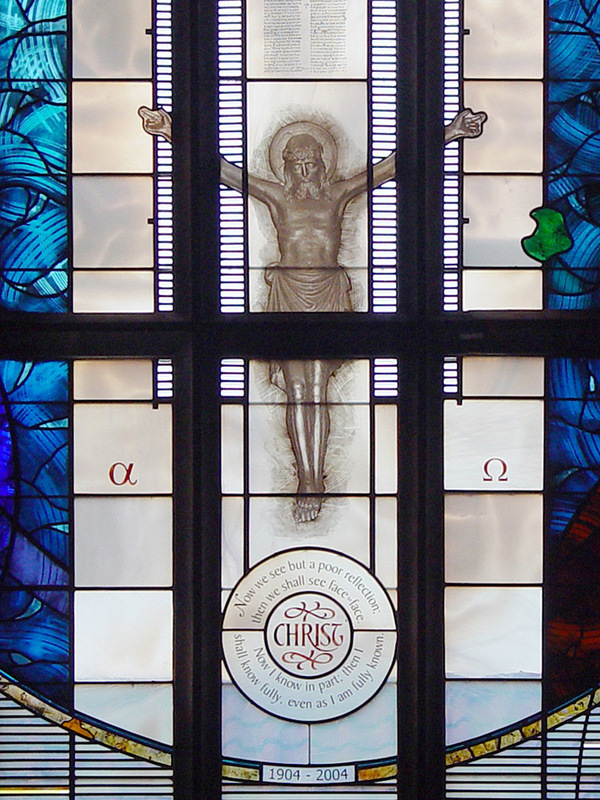 This image is taken from the statue of Christ in the entrance hall of the church. The statue has historical significance, being originally the centrepiece of the East end sanctuary before the alterations. The figure of Christ with arms out stretched, is placed at the centre of St. John the Evangelist’s Church in simple plan form. Within this plan horizontal pencil bevelled glass prisms run across the width. In the upper central lancet a folio of the Codex Sinaiticus showing the last page of the Gospel of John can be seen. This is one of the early important tenets of the Bible, written in Greek on vellum. (Sinai 4th century AD.) The use of bevelled glass held within the body of the church building reminds the viewer of the light of Christ contained within his church – the source of this light is the word of God. Below the central design are the symbols of Alpha & Omega, the beginning and the end. Above the main design are seven crowns representing the location of the church in Seven Kings. 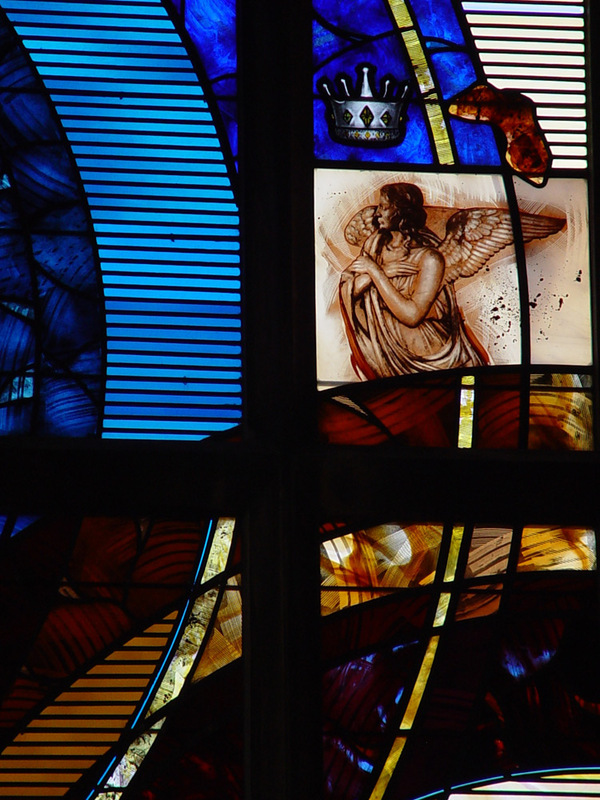 To the left and right are angels looking at the light, which emanates from the church. The left-hand angle is seen with a lily, one of the symbols of St. John. 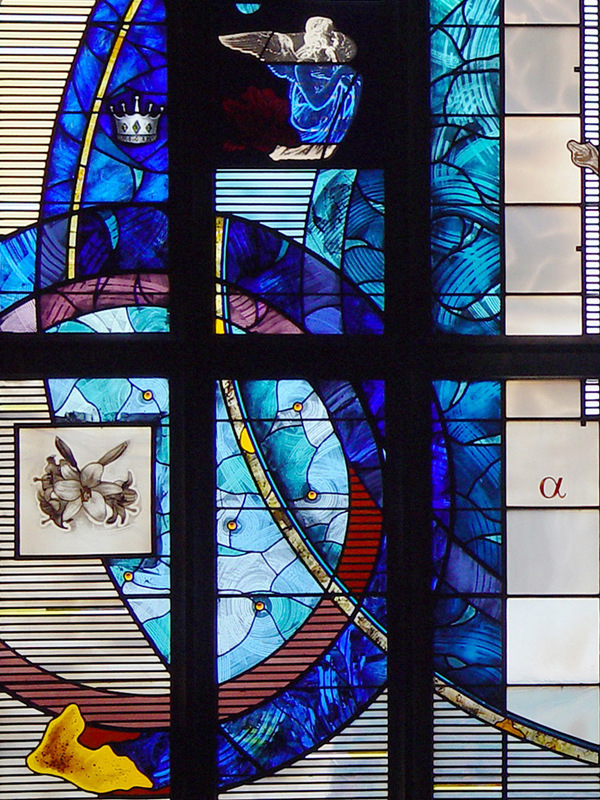 Again the theme of the lily is repeated in the bottom left-hand lancet with a stylised arrangement of lilies in a circle. The inscription has been re-designed as an elegant circular motif, which echoes the main circular elements within the design. 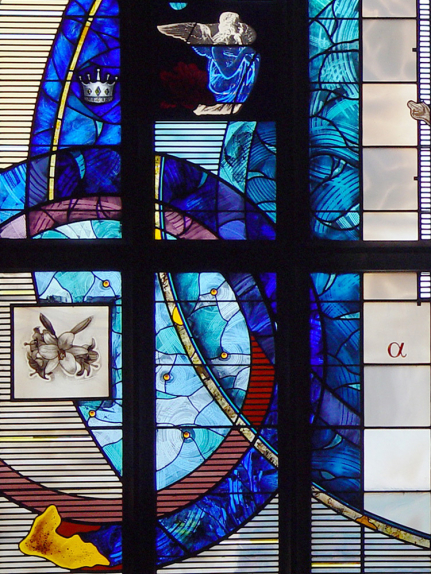 The bottom left lancet contains an image of a delicate arrangement of white lilies, a symbol of St. John the Evangelist. Another symbol of St. John can be seen in the bottom right hand corner in the form of a Golden Eagle. To summarise, the viewer is offered a collage of images in a random arrangement and is encouraged to assemble its meaning in their own mind. The design brings together the classical with the contemporary in a synergy of light & colour. There is a fascinating chemistry between the traditional elements and the abstract design. 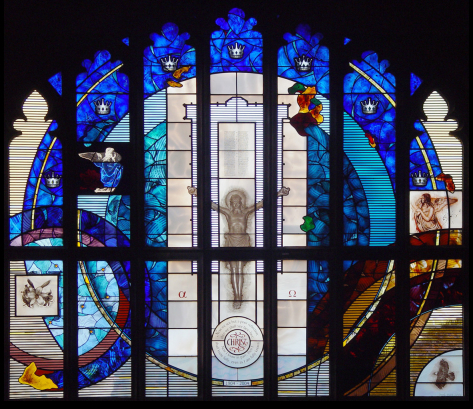 This is a thoroughly modern window that helps to bring contemporary art and the church closer together, but more importantly finds a new way of conveying the Gospel’s message using contemporary language and metaphor. This design respects and celebrates what has gone before, and looks forward to what is still to come. I hope the window will inspire, uplift, and engage the viewer in a personal journey of discover.